Mr.Tadao Chino, President of the Asian Development Bank (ADB) Saturday visited Trincomalee and witnessed the destruction to coastal areas in Tsunami disaster and met with victims sheltered in welfare centres. Mr.Y.Kanzaki, Chief Advisor, Mr.K.Senga, Director General, Mr.Alessandro A.Pio, Country Director and Mr.Lan A Gill of ADB accompanied him. Sri Lanka's Treasury Secretary Mr.S.B.Jeyasundara and his Deputy Mr.S.B.Divaratne also came with the ADB team. On his arrival in Trincomalee Navy Headquarters, he was received by Mr.S.Rangarajah, Chief Secretary of the North East Provincial Council (NEPC), Mr.T.Lankanesan, NECORD Project Director, Mr.N.Puhendran, Deputy Director and Mr.S.Arumainayagam, Trincomalee Town and Gravets Divisional Secretary. Later he visited three welfare centres in the Trincomalee town where Tsunami victims of all three communities are sheltered. Thereafter he handed over to the NEPC Chief Secretary two tractors and trailers through the NECORD project to be used for Tsunami relief operations in the district. Later he addressed officials participated in the event. He expressed his shock and grief over the loss of lives and properties due the natural disaster. 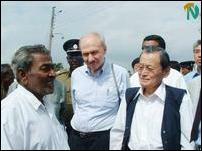 He said, "I have come to Sri Lanka to see the reality on the ground personally." 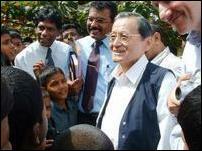 ADB President, Mr.Chino talking to children at a welfare centre in Trincomalee. ADB President Mr.Tadao Chino talking to a victim at Allesgarden refugee camp. He fled to in India in 1990 and returned to Sri Lanka in 1995. He told Mr.Chino that he was unable to resettle in his native village, Panmadawachchi. Relief operations and rehabilitation works should be implemented effectively and efficiently, he stressed. Mr.Rangarajah thanked the ADB President for his visit to Trincomalee. Thereafter Mr.Tadao Chino left to Muttur by helicopter and met with victims there sheltered in welfare centres. He returned to Colombo in the afternoon, sources said. 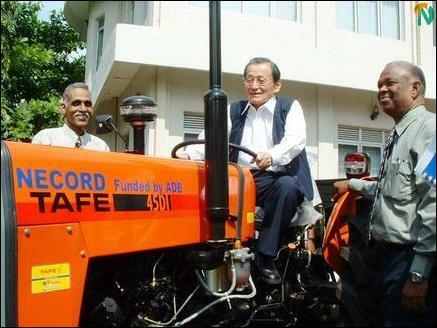 Mr.Tadao Chino on the driver seat of one of the donated tractors flanked by NEPC Chief Secretary Mr.Rangarajah (L) and NECORD Project Director Mr.T.Lankanesan (R).